There are many great ways that you can save for a home, but we have put together a list of what we think are the eight best ways you can save for a house. Although we say these tips are for saving for a home, many of these tips can be used to save a lot of money for almost any purpose—a car, an RV, a vacation, paying off your debts or saving for your retirement. Many people find that once they have achieved their first goal, these strategies help them achieve their other financial goals as well. So they keep on following them. It all depends on how motivated you are to accomplish your financial goals. Here are our tips. Saving for something important—like a home—is all about priorities. Do you go out to eat all the time, take expensive vacations, buy all the latest stuff and drive brand new cars? 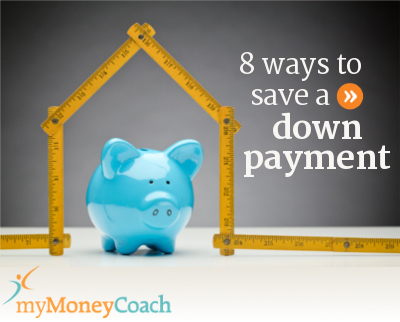 Or are you willing to tighten your belt and save for a house? It is up to you. Which is more important? If saving for a home is one of your top priorities, then try to identify other areas where you can cut back so that you can put more money into your savings. The best way to identify areas to cut back in is to do a budget. If you haven’t put together a budget yet, that is probably the best place to start. We can teach you how, click here to learn how to create a budget. You can’t really save money if you are paying a lot of interest to someone else. The first thing you should do is pay off all of your debts. Start with your smallest high interest debt, and pay it off. Then take the minimum payment from that debt and use it to help you pay off the next small debt that has the highest interest rate. Once you have that one paid off, the two minimum payments that you used to pay for those smaller debts can help you pay off your next debt faster (again, choose a small debt with a high interest rate). You will notice a snowball effect as the minimum payments you are freeing up help you to make larger and larger payments against one debt at a time. This is one of the fastest ways to pay off debt. Studies show that when people pay for things with a credit card rather than cash, they spend around 15% more. For the average Canadian household that pays for everything with credit in order to get points or cash back, they would save well over $3,000 per year if they paid with cash instead. Sure they'd lose their points or cash back, but on the best cash back cards in Canada they would only be giving up $400. They'd still be walking away with a big win. Your spending may not be as high as an average household, but you can see the point. If you're trying hard to save money, paying with cash can help you save more. If you try to apply for a mortgage with too much consumer debt, you won’t qualify. For most people to qualify for the house that they want, they usually have to pay down their credit card debts first. To learn more about what it takes to qualify for a mortgage, click here. If you have a partner and you have two cars, consider getting rid of one. This can save you thousands of dollars per year. You can move closer to where you work or where your partner works. You or your partner can look at walking, take transit (80% cheaper than owning a car), car pooling or even cycling to work (weather permitting). If you can make this work, you can potentially save one car payment every month, plus gas, maintenance and insurance. This adds up $9,000 per year for the average person. Even if you spend less than average, you're still looking at some big savings. Try to bank all of this money if you can. If you don’t want to go cold turkey on this idea, try parking your car for a couple of months first to see if it works for you. Then sell your car once you see that it does work. When you get a raise at work, take that extra money and save it in a separate savings account. It may not seem like much, but it will add up. Also try saving bonuses, extra sales commissions or tax refunds in your separate savings account. Do you buy a lot of new books? Try the library. They have zillions of books that you can borrow for free. Do you go out to a lot of movies? Try renting or sticking with cable. Some people are now even dropping their cable in favor of watching shows online. This works really well in the U.S., but it is getting better in Canada. Do you eat out a lot? Try eating out less or look for cheaper places to eat that you still like. You can also look for 2 for 1 coupons or buy an Entertainment Book and only eat at the places that have coupons (this will cut your eating out budget in half). Do you spend a lot of money on your hobbies? Try spending less or finding other hobbies that cost less—at least for a while. Do you buy a lot of new clothes? Try sticking with your current wardrobe for a little longer, or selectively buy clothing items that coordinate with what you already have. This will allow you to put together more outfits with fewer clothes. When you buy your clothes, look for sales. Do you take expensive vacations? Try something less expensive or closer to home. Do you buy a lot of new music? Try listening to the radio more, borrow music from the library or buy a card to monitor how much you download (and then you get what you actually want to listen to!). If you have a busy family, you can really save money if you eat at home more often (and this includes buying less snacks and drinks on the run), and look for fun things to do around your community that are free or don’t cost very much. If you go to the movies a lot, try renting. If you rent a lot, you could save even more by checking out the library. Many libraries have videos you can borrow for free. This option is really great for kids. If you are able to work some of these changes into your lifestyle, you will definitely save money. However, the key to saving money is to resist the temptation to spend it on something else right away, and to start considering the cheaper alternatives. You can withdraw up to $25,000 from your RRSP to buy your first home. This is a great way to come up with a down payment if you already have some RRSPs. If you don’t, this may be a good way to save money for your RRSP and at the same time get a tax credit to help reduce your taxes. The only catch to this program is that you have to pay the money back to your RRSP within 15 years. If you don’t repay the money, it is treated as income and you will have to pay tax on the money you withdrew as though it were income. Check with your financial planner or advisor to see if this option is right for you. The Tax Free Savings Account can also be a great place to save your down payment money. The money can grow tax free in this account. This means you won’t have to pay income tax on the money you earn as it grows in this account. Consult with your financial planner or advisor. From time to time some cities have programs where they provide new home buyers with part of their down payment for their first home as an interest free loan. Programs like this are usually initiated for two purposes: 1) to make it easier for first time home buyers to afford a home in an expensive city, and 2) to redevelop a part of the city that is struggling. These programs usually have very specific requirements. You can check with your city hall to see if your city has any sort of program like this to help first time home buyers. In the past, Winnipeg, Manitoba and Surrey, British Columbia have offered up to $20,000 per couple under these programs. The money is repaid without interest over a set number of years.